Thick chilling mist swirled across the road as I drove to Aviemore past fields of soggy, dirty, thawing snow. Not a good day for the hills it seemed. High above though the greyness had a blue tinge, a hint of clear skies. And soon I was leaving the mist behind as the road climbed out of the Glenmore woods and into the mouth of Coire na Ciste. Here I swapped the car for skis and set off up the east shoulder of the long, narrow, steep-sided corrie. As I gained height the hills began to appear above the mist. Across Glenmore Meall a’Bhuachaille appeared at first as a tiny tip of white above the clouds but soon became a distinct cone far above the gloomy clouded glen. 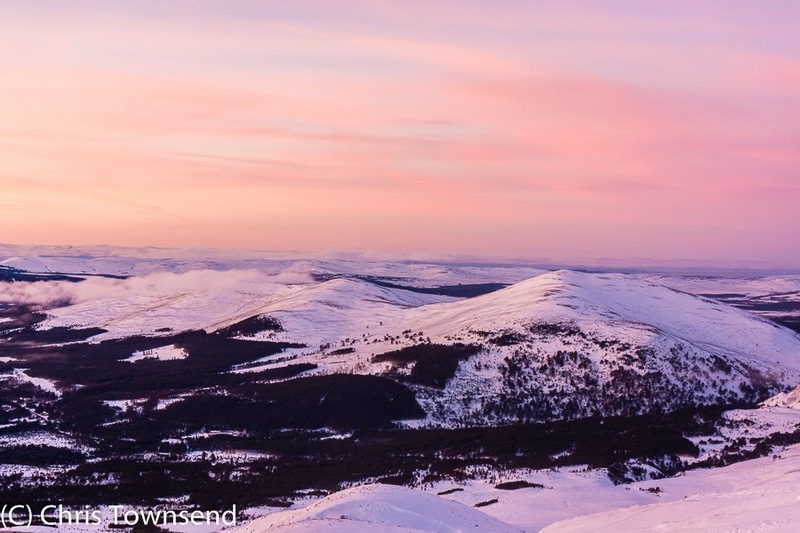 The snow was glazed and icy, refrozen after a surface thaw, but my climbing skins gripped well and I made steady progress towards the broad north ridge of Cairn Gorm. 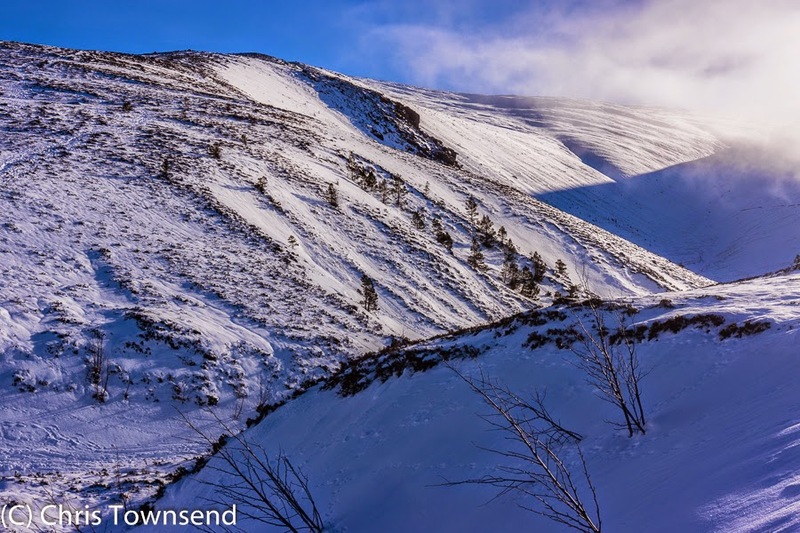 Many others were about on this fine day – ski tourers and snowshoers making good progress, walkers doing less well as they sank into the crusty snow. The air was calm and the sun warm and I soon discarded hat and gloves, not a common occurrence in early February in the Scottish Highlands. The clarity of the air was superb and I gazed across a vast array of snowy hills to distant summits. 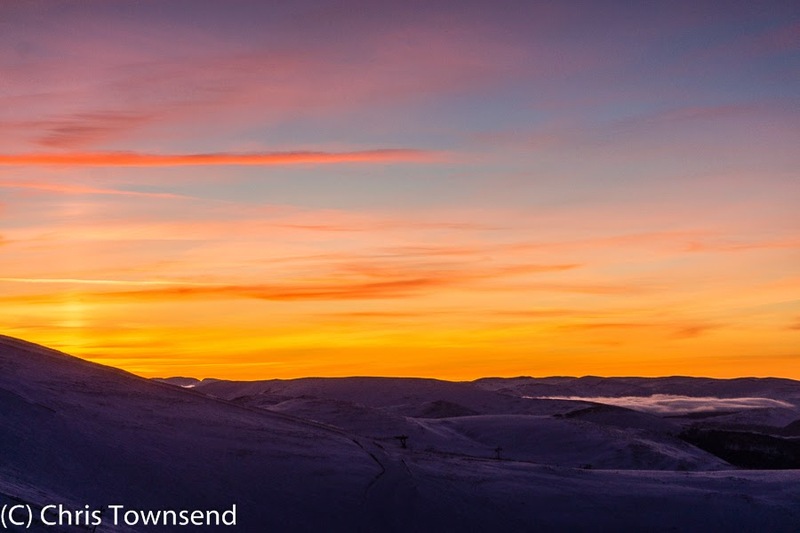 Once on the ridge I headed for the busy summit of Cairn Gorm. Just for a time a cool breeze swept the slopes and I felt quite chilly even after my hat and gloves were back on but the summit itself was calm. 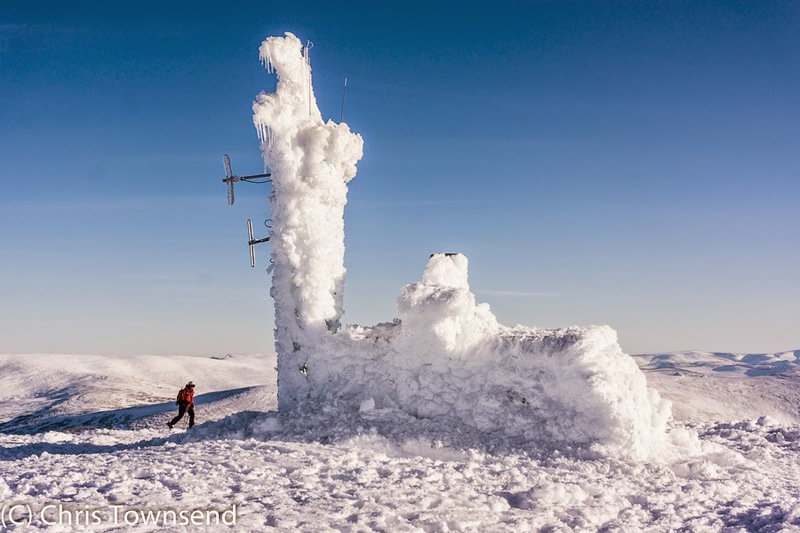 The weather station was decorated with fantastic wind-carved frost, ice and snow. The views were superb. Retracing my steps, or rather tracks, I went back down the ridge, skittering somewhat on the hard wind-rippled snow, and over to the quiet minor summit of Cnap Coire na Spreidhe, where I could sit alone and watch the landscape and the sky. 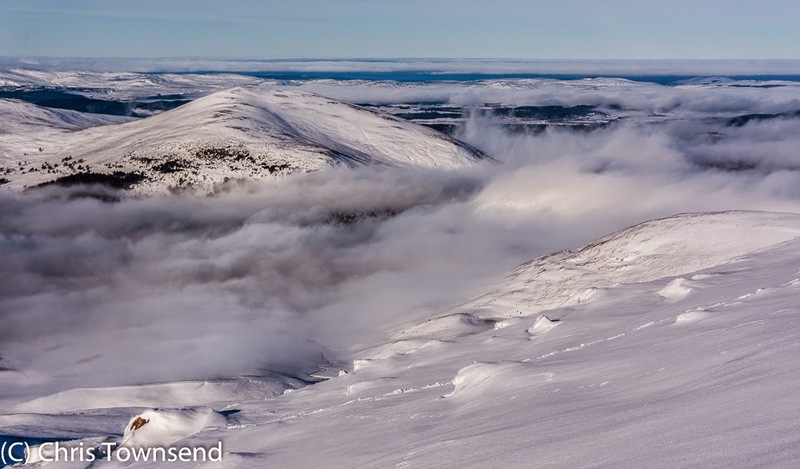 The mist in the glens was beginning to dissipate now, as it continued to do when I skied on along the ridge, reluctant to leave this spectacular day behind. The sun was dropping towards the horizon though so eventually I turned and traversed back to pick up my ascent route and follow it down to the car. The last hour of the day brought a final burst of beauty as the sky turned pink, then orange then deep red. The lights of Aviemore appeared in the distance as I skidded down the last slopes. What a glorious day! Wonderful account, Chris. I need to get me some skis ! A lovely retelling of a glorious day Chris.